This sturdy 2 hump bike rack is constructed from heavy-duty steel with a protective powder-coating finish. This slightly textured powder-coating finish minimized the harsh impacts of corrosion and rust while the UV additive	inhibits the fading effects the bright sun will exert. Surface mounting hardware is included, also an optional in-ground mounting kit is available (sold separately). More and more people are electing to ride bicycles as their primary mode of transport. Question is how to accommodate this growing population and encourage them to visit your destination. 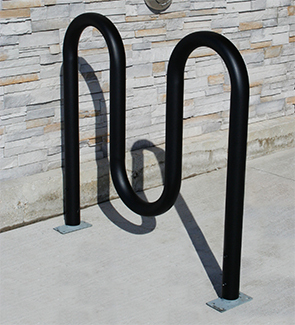 The Lasting Impressions 2 Hump Bike Rack is a great solution offering safe and secure parking for up to 5 bicycles.